Advanced Micro Devices will release a new tablet chip code-named Mullins that draws about half as much power as its predecessor, the Temash chip, as the company struggles to compete with Intel. The Mullins chip will have two to four CPU cores code-named Puma and draw around two watts of power in certain usage scenarios. Variants of the chip, based on x86 architecture, will also be used in low-power laptops, AMD said. It will appear in tablets in the first half of next year. "It's going to be a very exciting product for us in 2014," said AMD's chief technology officer, Mark Papermaster, during a speech at the AMD Developer Summit being held in San Jose, California. The speech was webcast. The Mullins chip will provide 139 percent better "productivity performance per watt" compared to existing tablet chips code-named Temash, AMD said in a statement. The Temash chips, which started shipping earlier this year, have been a failure, appearing in only a handful of tablets and low-power PCs. AMD's Temash chips draw three to four watts of power in specific usage scenarios. The tablet chip will also have graphics cores based on AMD's latest Radeon technology, and also a security processor based on ARM's Cortex-A5 CPU core. AMD also announced a new laptop chip code-named Beema, which will draw 10 watts to 25 watts of power. It will have up to four Puma CPU cores, a security processor and integrated graphics cores. The new chips will be made using the 28-nanometer process, and products will appear in the first half of next year. More details about the processors will be shared at International CES in January next year, Papermaster said. 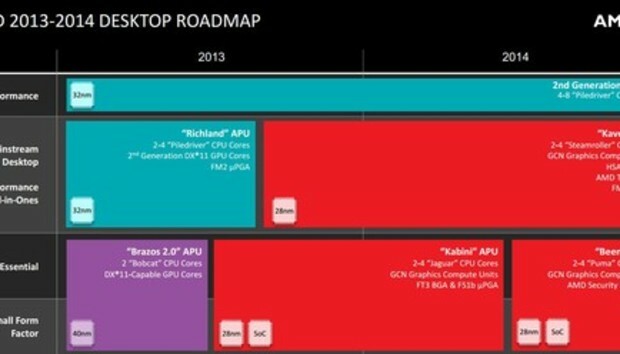 The new chips will be key to AMD's survival in the tablet and PC markets. During the third quarter this year, AMD lost market share to Intel as it tried to expand into non-PC markets such as game consoles. AMD's x86 PC processor market share was 15.8 percent during the third quarter, declining from 16.1 percent in the same quarter last year, according to a study from Mercury Research released this week. Intel's PC processor market share was 83.8 percent, up slightly from 83.3 percent. Most tablets and smartphones today come with ARM processors, and x86 is not the dominant architecture in the space. But even in the small x86 tablet market, AMD is trailing Intel, whose Atom chips code-named Bay Trail have been adopted in tablets from companies like Asustek, Dell, Hewlett-Packard and Toshiba. AMD's low-power chips were designed for both low-power laptops and tablets but were not tuned specifically for tablets, said Dean McCarron, principal analyst at Mercury Research. "Introducing products that are more specifically tuned in terms of lower power makes sense," McCarron said. Intel plans to come out with tablet chips made using the 14-nanometer process next year, which could provide a performance and power efficiency edge over AMD's 28-nm Mullins chip.